Constructed of Odi's propietary material compounds that they have spent over 25 years perfecting. 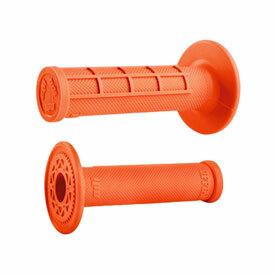 These medium compound Half-Waffle grips provide an excellent combination of soft feel and lasting durability. Value priced and available in an assortment of colors to fit your style. Good quality grips, went on easy with some grip glue. They didn't slip on the bars or my hands. I love these grips. The compound is perfect. They are soft but do not break down as fast as some other soft compound grips. Buy these in a medium compound, hold up well in tip overs. These grips are great, my son loves them on his KTM. I really do like these grips I've always run pro taper pillow top grips but these odi grips came on my new bike stock and at first I thought they wouldn't be that great but after just 15 hr on these and there perfectly fine and very grippy still I just wish they were a little softer and more plush. Works great, fit is good and last for a long time. plus cool colors. Good grips at a good price. Ordered these for PW50 fit perfect. Would fit all mini bikes. They work great! Cheaper alternative to Pro-Taper or Renthal. nice to have as an extra set but they do not hold up as well as i wanted. end caps break off after just laying the bike on the ground. so as long as you have a kickstand and dont crash they wrok and feel great. Good comfortable and affordable grips! Is this a suzuki yellow or is it more of a yamaha yellow? I have an anniversary edition YZ250f and I want to see if these would look good on my bike. BEST ANSWER: It’s more than of a Suzuki yellow but it’s pretty close to it I think I would look rad! It’ll look sick man! Get em!